This Vienna based composer, singer, songwriter leads the audience to another world with her delightful voice, poetic lyrics and clever and fun arrangements with unusual instruments. This life affirming tune features Agnès on the ukulele. Trisha Yearwood and Crystal Gayle. His latest release includes all originals plus harmonies by the legendary Judy Collins. It’s a brilliant, radio-ready album. A folksinger’s call to SongFarmers and all front porch pickers. This cut features a lineup of allstars including dobro great Rob Ickes, Ron Block (AK & Union Station) Pat Flynn (New Grass Revival) and Raymond and Ruth from the McLain Family Band. Inspired by a lost song that her mother wrote, Lisa captures the good time spirit of the blues on her beautifully produced album. Upbeat and fun from the best voice in contemporary roots music today. This haunting track has a Dylan-esque Oh Mercy vibe. Beyond the clutter of hostile news cycles, a true interpretation of what it’s like to seek the American Dream. This master storyteller dives into the hearts, hopes, and aspirations of a family trying to cross the border. An important and brilliant work. Tom and his band a deliver passionate performance full of funky roots music with scorching guitar. Tom has spent the last 45+ years as a guitarist and singer based in his hometown of Washington, D.C. This CD proves to be his best work to date. Dean is a legendary under-the-radar artist with a stunning resume, he even produced Odetta’s brilliant debut album. His new CD celebrates his love of folk music and Carl Sandburg … Dean is an important artist your audience needs to hear. This fourth generation Appalachian folk artist exposes his soul on his debut album. Jack’s record combines elements of his folk music up bringing with modern day struggles. 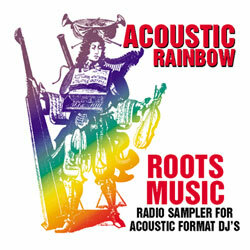 Look for his album in the next Acoustic Rainbow sampler mailing. While honoring the folk tradition and pushing new boundaries, Patricia engages and inspires with heart, mindfulness, and good humor. Her versatile voice and skillful guitar playing help to share a positive message of community and hope. Master songwriter Si Kahn is using this album to spread the word about the struggle to stop the Pebble Mine and to protect Bristol Bay in Alaska. It is a solid song supporting a very worthy cause. Visit MusiciansUnited.info for more info. Songwriter legend Tom T. Hall called Bill Wence “a national treasure …” This is title track from a beautofully recorded, radio-ready album. DJs who like to add a dash of genuine country music to your playlist should ask for the entire CD. Anchored by soaring vocals and head-bobbing instrumentation, New York based Common Jack has provided a rootsy, politically charged track that puts their Southern upbringing on full display. Format: AAA Artist: Carl Chesna & Co. This folk rock tune from this Asbury, NJ band tells the story of the Greek myth Demeter & Persephone – explaining the changes of seasons. Your listener’s will love this lush composition that’s inspired by Suzanne Vega & T.S. Elliot. Award winning songwriter Bob Rowe’s title cut to his 23rd album is an original song with an uplifting message of hope for our troubled world. The album really showcases Bob’s songwriting gifts and will be an inspiration to radio listeners. 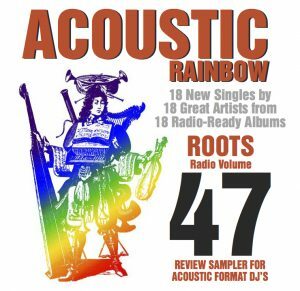 Nashville’s JB Bruck returns to the Acoustic Rainbow with this song celebrating life from his brilliant new album. A beautiful mid-tempo acoustic arrangement with universal lyrics that speaks to all ages. A timeless compostion and radio-ready. This Emmy-nominated songwriter latest CD is a 21st century interpretation of some of Shakespeare’s most famous female characters. Tender and haunting, this moving anthem finds Isabella (from Measure for Measure) confronting a leering bully. With bones, jug, xylophone, kazoos and more, it’s a 21st century spin on early Americana music. Whether originals like this tune here or other hidden gems, this album is full of fun, upbeat and creative music. A roots DJ’s dream album. From a timeless album comes a tale about the erosion of our American Heartland. Mike and his all-star backed band provides a raw roots sound that leaves the listener with a vintage message of hope.